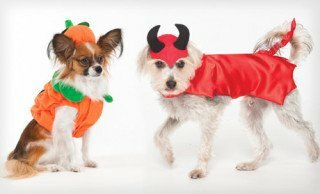 Is Your Pet's Halloween Costume Safe? It's one thing to slide a doggy jersey on your pit-bull during football season, but it's quite another to deck him out in a full uniform for Halloween. The helmet is going to get in the way of his sniffing and block his sight. Also, the tight little pants are likely going to be too restricting and he's going to have a miserable time. When it comes to dressing up your pet for Halloween, you should always take the same care and caution as you would with your children. And let's face it... sometimes a pet can be a bit more finicky than children when it comes to wearing new things. That being said, if you plan on dressing your pet up for Halloween, you might want to let them get used to the costume first. Do this by dressing them up prior to Halloween and letting them wear it around the house a few times. This way, the outfit won't be new to them on Halloween night, likely saving you a headache and your pet a wretched night. In terms of the costume itself, think of the football uniform example from earlier. Just because something looks great doesn't mean your pet is enjoying it. Make sure the costume isn't overly snug. Your pet should be able to sit, walk and even play in the costume without any restricted movements. Also, a costume should never be very tight around your pet's stomach, as that can make it difficult to breathe. Also make sure no part of the costume is cutting into the area beneath your pet's legs. You will also want to make sure that the eyes, nose, and ears are not covered. If any of these key areas are covered, your pet won't have full use of its senses, making an already hectic and unusual night all the more stressful. If the costume absolutely calls for a mask, make sure it allows plenty of room for eyeholes and holes for the ears and nose to poke out. Lastly, just like you would with a child, make sure your pet's costume has no small pieces that can fall off and be carelessly eaten or gnawed on. Many costumes are made of paints, rubber, and other materials that could be very harmful to your pet if consumed. So if you're planning on a bee costume where the antennae are protruding from your pet's head, make sure those antennae remain pointed towards the air and out of reach of your pet's mouth. Using these precautions, your pet might just enjoy Halloween night as much as the neighborhood children. Of course, you may want to restrict your pet's trick-or-treat outing time; seeing so many odd sights and witnessing the commotion of kids hopped up on sugar and people in spooky attire may put your pet in a sense of danger. Use your own judgment here, based upon your pet's behavior in unusual situations. See our articles on great Dog Costumes here. See our picks for the Best Pet Costumes of 2012 here. Diapers For Chickens -- No Kidding! What Is That In The Distance? The "Tricerapug" Animal Video Of The Day!! !